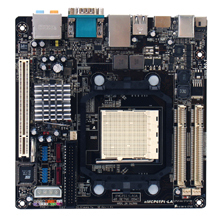 AOpen nMCP68PVNt-HD is the first mini-ITX motherboard that supports HDMI and HDCP for home theater PC systems. It comes with the MCP68PVNT chipset, the latest chipset from nVIDIA, designed for AMD Athlon 64 X2, Athlon 64, and Sempron CPU with AM2 socket for demanding tasks and full HD entertainment for your home. The MCP68PVNT chipset supports DirectX 9 and the H.264 hardware decoding allows you to play modern 3D games and at the same time decreases the CPU load when playing HD content. nMCP68PVNt-HD comes with a HDMI port that can deliver 480P, 720P and 1080P high-definition video and audio to your display . And the HDCP (High Definition Content Protection) support will play back all HD content with no limitations. You can install AMD Athlon 64X2, Athlon 64 and Sempron CPU with FSB 1600/2000 MHz to maximize system speed. And the So-DIMM DDRII 667/533/400 RAM (up to 4GB) can help the system to keep delivering high performance. AOpen nMCP68PVNt-HD provides various expansion features such as a PCI port for low-profile cards. There are 2 SATA and 1 PATA ports for HDD and ODD. For external connection, it can output to two displays at the same time (via VGA and HDMI), giving you a more efficient working environment. There are USBx4, Gigabit LAN port, 7.1 Audio, MIC jacks, and Line/SPDIF-in ports. AOpen has developed a special CPU cooling fan and 135 watts power adaptor for nMCP68PVNt-HD, which allows you to build a powerful and silent small form factor system for home entertainment.